The parish church of St Peter was dedicated in 1535. The Grade 1 listed building was subject to a lot of restoration work in the late 19 century and is a prominent local landmark, occupying an elevated position in the centre of the small village. The church of St Peter consists of chancel with north chapel, nave with north aisle and south porch, and west tower. The church tower has six bells, four of which were rung to celebrate Nelson’s victory at Trafalgar. One of the bells is also believed to date from the 15 century as is the body of the wooden eagle lectern. 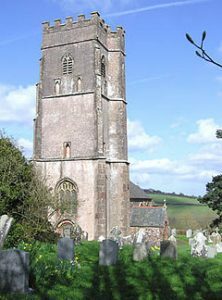 Now part of the St Andrews (Wiveliscombe) benefice, St Peter’s did support its own minister for almost 900 years (1187 till 1951). St Peter’s has a very full schedule of services and events hosting regular Sunday services twice each month and much more – details of which are shown below. A time for children & young people & the young at heart! For further information about services, youth clubs and other activities please visit the Wiveliscombe Churches website.